The feds are working with Australian and British investigators to investigate Monaco firm Unaoil and its partners. The FBI, U.S. Department of Justice and anti-corruption police in Britain and Australia have launched a joint investigation into revelations of a massive global bribery racket in the oil industry. The news comes as Fairfax Media and The Huffington Post reveal that U.S. giant Halliburton and its former subsidiary Kellogg, Brown & Root are embroiled in the Unaoil bribes-for-contracts scandal through their operations in former Soviet states. The biggest leak of confidential files in the history of the oil industry also unveils rampant corruption inside Italian oil giant Eni in many of the countries in which the firm has been contracted by national governments to manage their oilfields. Texas firm National Oilwell Varco, Singapore conglomerate Keppel, Norway’s Aker Kvaerner and giant Turkish joint venture GATE also are implicated. 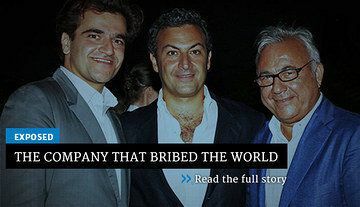 Information from hundreds of thousands of emails to Unaoil’s chief executive, Cyrus Ahsani, show individual executives and managers from Halliburton and Kellogg Brown & Root, which split in 2007, knew or suspected that Unaoil was acting corruptly to win contracts in Kazakhstan. Managers from Eni, Spanish Firm Tecnicas Reunidas, French firm Technip, drilling giant MI-SWACO and Rolls-Royce not only actively supported bribery, but were offered, or pocketed, their own kickbacks. And U.S. defense giant Honeywell and Australian firm Leighton Offshore agreed to hide bribes inside fraudulent contracts in Iraq. Companies approached by Fairfax Media and The Huffington Post about their contracts with Unaoil have emphasized their strong anti-corruption policies and have committed to investigating their dealings with Unaoil. The U.S. Department of Justice, FBI, U.K. National Crime Agency and Australian Federal Police are now jointly investigating Unaoil and some its multinational clients. The probe is likely to be one of the world’s biggest, given the number of companies and countries involved. The leaked Unaoil files show that in the Middle East, Unaoil bribed two Iraq oil ministers, Iranian oil chiefs and the right-hand man of Muammar Gaddafi’s son, among others. Questions are emerging about how Unaoil operated for so many years with impunity, using bank accounts in New York and London to launder funds and pay bribes from 2000 to 2012, and possibly more recently. Unaoil has its headquarters in Monaco and is controlled by the wealthy Ahsani family, led by patriarch Ata Ahsani and sons Cyrus and Saman. The trio all have British passports. Many of Unaoil’s crooked deals were organized in London, or used U.K. and U.S.-linked middlemen, bank accounts and shelf companies. British authorities appear to have been in the dark about Unaoil and the Ahsanis, who also operate a London property investment company. The British foreign office has even assisted Unaoil overseas, giving Unaoil and its executives briefings and support. The Ahsani family, meanwhile, has mixed freely with the elite political and business crowd in Britain and elsewhere in Europe. Saman Ahsani sits on the board of an Iranian NGO in London, alongside former chancellor of the Exchequer Norman Lamont. The Ahsanis host charity events with Prince Albert and Princess Caroline of Monaco, and have paid Prince Albert’s good friend, Mike Powers, to sit on Unaoil’s advisory board. There is no suggestion that Powers, Lamont or the Monaco royals were aware of Unaoil’s corruption. To win contracts for its clients in Kazakhstan, Unaoil paid multiple bribes to Eni and Kazakh officials overseeing tenders in the giant Kashagan oilfield and elsewhere. It appears from the leaked files that senior managers from Kellogg Brown & Root, or KBR, were pushing Unaoil hard to win favor. One email written from a KBR manager told Unaoil to concentrate its efforts on “a good spaghetti house” and “a little shashlick.” The code refers respectively to the officials from Italian company Eni and the Kazakh government who were overseeing the contracts KBR wanted to win. The leaked files show Unaoil sought to corrupt a number of influential figures, including senior Eni manager Diego Braghi and Kazakh senior official Serik Burkitbayev, to give its clients an advantage over rival companies. Unaoil used the same formula in neighboring Azerbaijan, where KBR also paid it millions of dollars to help it win contracts. A leaked KBR file said Unaoil’s key middleman in Azerbaijan was "very close to the President and his family ... [and] has an access to every office in the country”. This middleman, Reza Raein, received millions of dollars from Unaoil in multiple bank accounts. In return, he leaked highly confidential information from senior Azeri government officials to Unaoil, which was fed back to its multinational clients. Unaoil also sought to build its shady empire in Turkmenistan and Uzbekistan, including by liaising with a middleman who promised access to “the company of the [Uzbek] President’s daughter, Gulnara Karimova”.